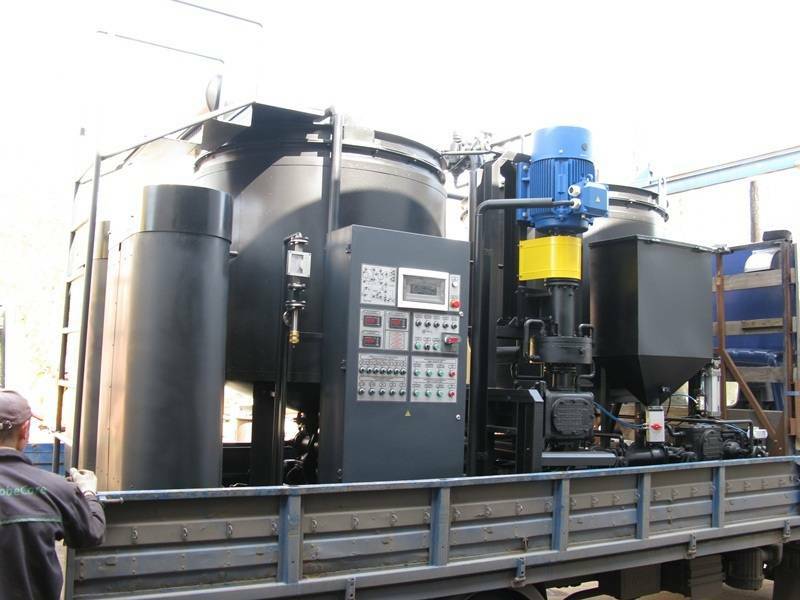 GlobeCore PMB plant UMB 6 is designed for production of polymer modified bitumen with SBS polymers. 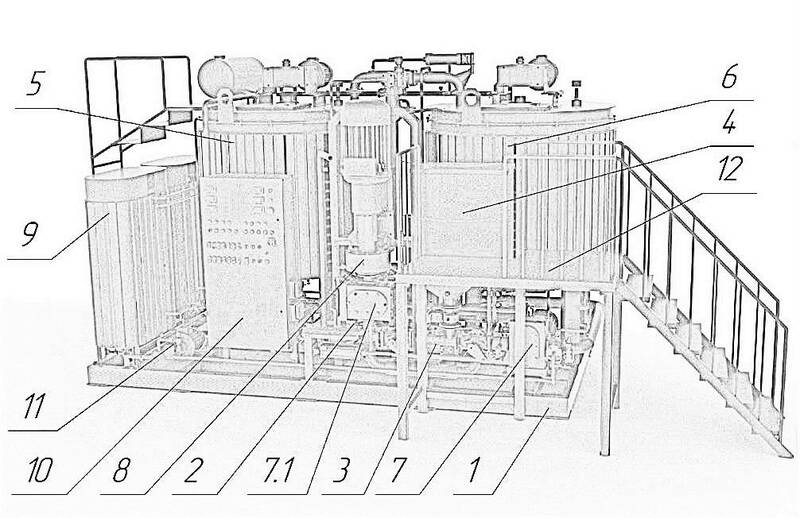 Identification key: 1 – Frame; 2 – Inlet/outlet pump (placed at the back of the plant); 3 – Mixer; 4 – Polymer tank; 5, 6 – Reactors; 7 – Bitumen pump (pumps bitumen to the mixer); 7.1 – Bitumen pump (pumps bitumen to the colloid mill); 8 – Colloid mill; 9 – Heating oil heater; 10 – Control panel; 11 – Plastificator injection block; 12 – Platform. Unit Is mounted on a common welded frame. All relevant units are connected by steel pipes with flange joints. Consist of insulated bitumen tanks, stirrers, heating jacket and temperature sensors. Reactor cover is equipped with bitumen inlet nozzle, modifier inlet, colloid mill connection sleeve. Reactors are connected to each other and colloid mill through three way valve. Consists of steel case with a heating jacket. The gap between rotor and stator is adjustable. Mill’s output is connected to reactor block and input is connected to bitumen pump. Colloid mill is powered with asynchronous electric motor (45 kW, 3000 RPM). Two Bitumen pumps DС-185 are driven with three-phase asynchronous electric motor 5А 160 М4 (18,5 kW, 1500 RPM) through reducer 1MC-160-10. Type of pump: gear pump (500 l/min, 0,59 MPa ,415 RPM, 8 kW). Three-way ball valves BK2-BK9 made from cast iron and heated with heating oil. Assembled in steel waterproof enclosure to IP 54. Contains all electrical apparatuses, contactors, thermo-relays, fuses, buttons and main switch. Technological parameters of the production process are programmed and controlled with microprocessor-based automatic controller GE Fanuc. Injects plastificator into bitumen. Comprises gear pump, flowmeter and valve. Injection of plastificator is automated and starts when bitumen is pumped into the plant. Consists of a gear pump, valve and flowmeter with totaliser. Consumption of adhesion additive is controlled with a valve and a flowmeter. 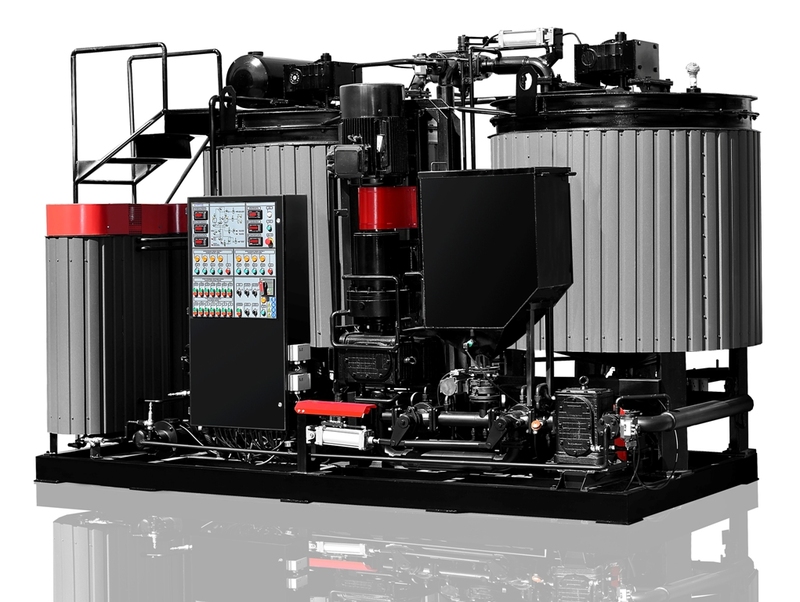 Consists of 250 L tank, valve, low level sensor and injector. GlobeCore UMB-6 is a batch type PMB modification plant. 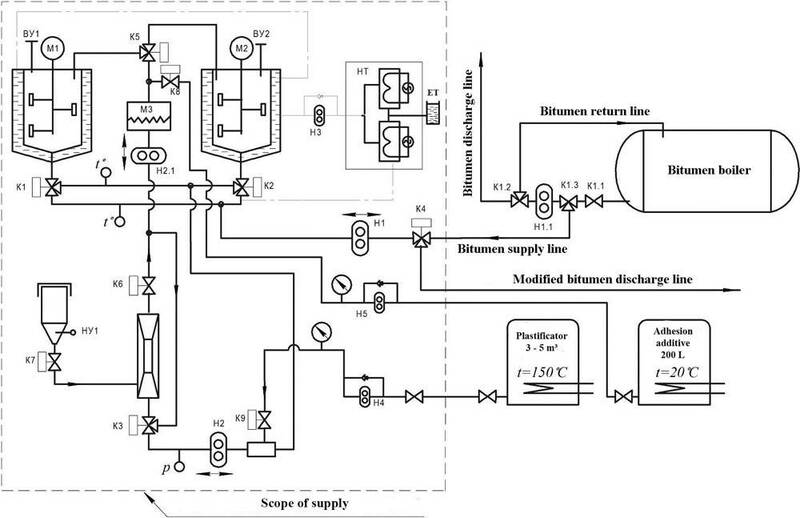 Plants design allows to prepare modified bitumen in both reactors simultaneously or in one of the reactors only. Operational principle of each reactor is the same and starts with heating of bitumen in an external bitumen boiler to 190 – 200 °С, warming up of UMB 8 with heating oil and loading of consumables (polymer, plastificator). Hot bitumen is then pumped by pump H1 up to the upper level of the reactor. Pump H1 turns off and stirrer turns on. 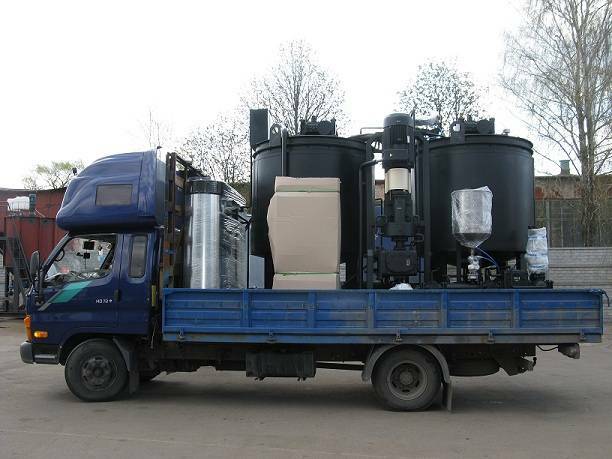 Polymer tank T1 shall be loaded with required amount of polymer. Operator activates modification mode by pressing corresponding button on the control panel. Pump H2 comes on and pumps bitumen to the mixer CM. Valve K1 turns into open position and pump H2 pumps oil from the reactor. Pump H2.1 then further feeds bitumen to the colloid mill. Valves K3 and K6 turn into open position and let bitumen come to the mixer’s nozzle. When pressure on mixer’s nozzle reaches 6 bar, polymer valve K 7 turns into open position. Polymer is drawn into the mixer CM. Mixture of bitumen and polymer is pumped by pump H2.1 to the colloid mill. Mixture is homogenized in the colloid mill and fed back into reactor. Bitumen is pumped to external tank by outlet pump. GlobeCore warrants the machinery supplied under this specification against defects in material and workmanship under normal use and service for a period of 12 months from the date of commissioning.